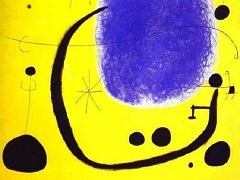 Joan Miro was deeply influenced by his country's native landscape and artistic heritage. 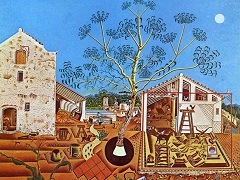 During the early part of his career, he lived in Paris, where he was associated with the French Surrealists and its practitioners, but he returned to settle in Spain after World War II. This deliberate remove from the center of the art world is symptomatic of Miro's independence, a temperament that would mark his art as well as his life. 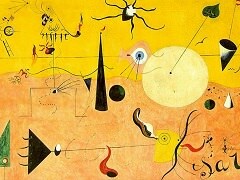 Mining the possibilities of free invention encouraged by Surrealism, Miro developed a style that drew from highly personalized and psychological references. 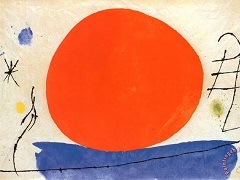 Often beginning with a recognizable starting point, Miro transformed his subjects through whimsical color and free play with form. 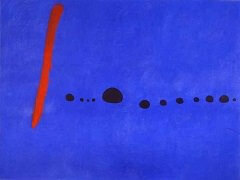 The Potato is emblematic of Miro's poetic riffs on reality. It takes as its subject a gigantic female figure who stretches her arms wide, against a blue sky and above a patch of earth - perhaps a potato field. The billowing white shape of the figure is attached to a red post in the center of the composition like a scarecrow on a pole. 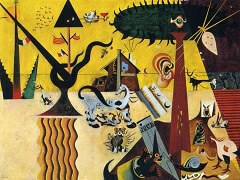 Miro surrounded his merry "potato-earth-woman" with fanciful decorative objects, some of which are "earthy" and some not. The figure has one brown-and-black breast that "squirts" a long, black, winding thread, as elfin creatures flutter in the sky around her. 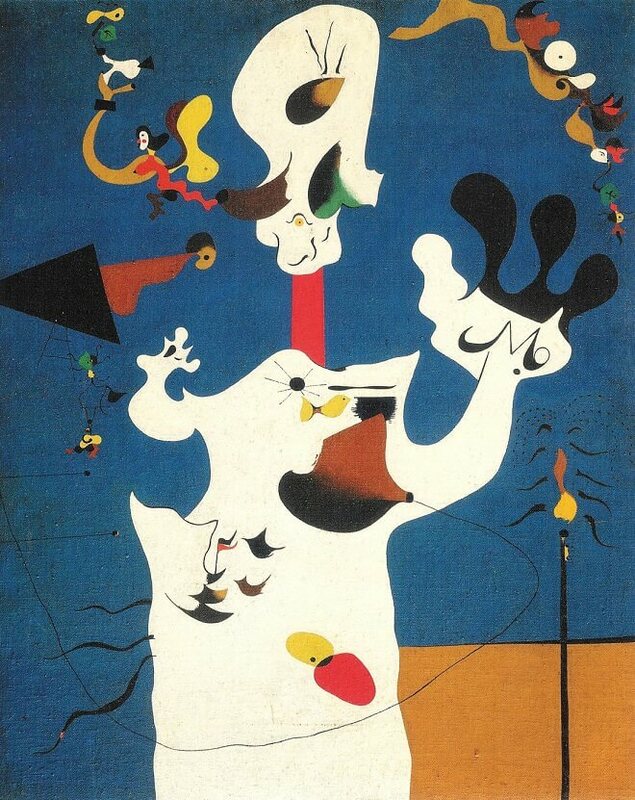 At the left, a red and yellow "butterfly-woman" takes flight from her brown banana-like nose as other creatures climb a ladder - one of Miro's favorite motifs. Beyond the earthiness of the subject, the painting's title appears to be derived from the representation of an actual, recognizable potato - the small, brown, oval object with three tendrils growing out of its upper edge, which is lodged in the woman's forehead.